The Crab Place is dedicated to delivering the freshest, award-winning Maryland seafood from our docks to our customer's door. We can deliver everything you need for a delicious seafood feast including soups, sauces, seasonings, and gift certificates are also available. 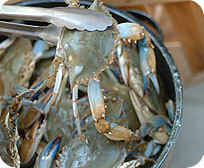 Place the live crabs in a large bucket of cold ice water and let them chill for 10 minutes, to stun them. Meanwhile, in a large stockpot over medium heat, melt the butter and add the oil, onions, pepper, parley, garlic, half of the cabbage, spinach, wine, salt, and pepper and cook until the cabbage starts to wilt, about 5 minutes. Reduce the heat to low. Remove the crabs from the ice water one at a time (they should be cold enough simply to lay in your hands) and place on a cutting board belly side up. Insert a sharp object, such as an ice pick or sharp knife, in the crab's underside between the bottom of its mouth and the tip of its apron. This kills the crab instantly. With your fingers and/or the knife, unfold the crab's "apron," located in the middle of the crab's body. Pull it back away from the body, break it off, and discard. Turn the crab over, put your thumb or the knife under the back edge of the top shell, lift it up, pull it off, and discard. Remove and discard the six gills, which look like spongy fingers, and then remove their entrails under forceful cool running water, using your fingers, if necessary. Once clean, tear off the crab's mouth and any sharp shells that might be protruding. Finally, break the crab in half and set aside. Repeat with the remaining crabs. When all the crabs are cleaned, place the crabs in the pot along with 1 cup of water. Stir the crabs around and add the second half of the shredded cabbage. Once the crabs and cabbage are well combined, cover the stockpot and raise the heat to medium. Cook the crabs until the shells are bright red, about 15 minutes. Occasionally check the water level, which should increase as the crabs release their juices (but if this does not happen, just make sure there is enough water to continue to cook the crabs). Stir the pot well halfway through so that all the crabs get a chance to cook directly in the liquid. Serve immediately in a large bowl with fresh bread to sop up the juices.